The winter season for many people heralds a time for family gathering, and thoughts of sharing and giving. Though many of us try our best to make or shop wisely, there are sometimes people that we want to buy or make something for, but due to particular tastes, or jut because they seem to already have just about every idea that you can come up with, a gift card seems to be the only solution. Sometimes, however, a gift card can seem just a little impersonal. 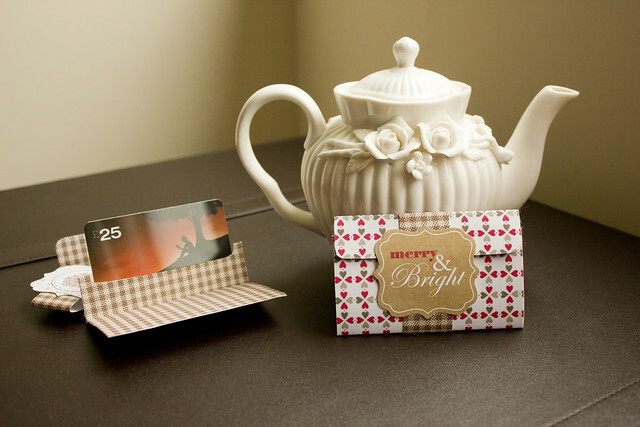 Make sure that your gift cards are personal as well as convenient by dressing them up in a beautifully handmade gift card holder. 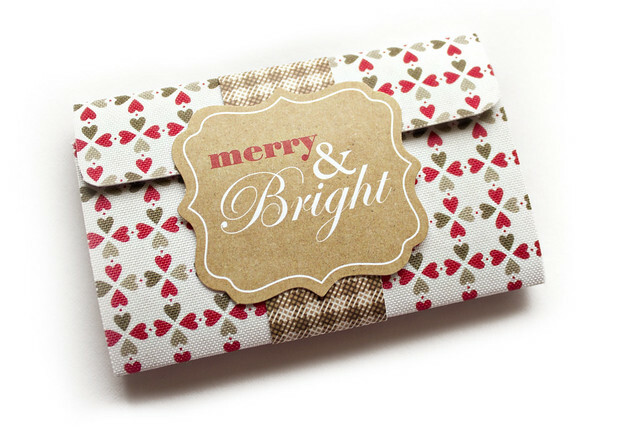 These little gift card wallets not only look fantastic, but also put a little touch of handmade love back into the act of giving something that you know the recipient will actually be able to make use of. To make your own, all you need is two sheets of coloured or patterned paper, plus a glue stick and scissors, and any embellishments you may wish to add, such as buttons, greetings card toppers or small Christmas decorations. 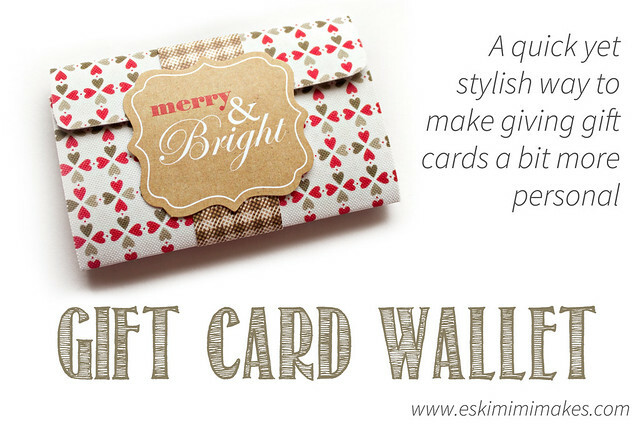 To begin, download and print the Eskimimi Makes Gift Card Holder sheet. This can either be printed directly onto the reverse side of one of your sheets of paper (the one intended for the inside of the holder) for maximum speed and ease, or you can print it onto sheet of card to create a template if you plan on making a number of wallets (which is more economical, but takes a little longer). Once you have transferred the pattern onto the reverse side of your inner paper, cut along the solid outer line and score along each of the dotted an dashed lines. Fold along the dotted line so that the right sides of the paper meet, and cut out the grey shaded area through both layers. Fold back along the same dotted line, but this time so that the wrong sides of the paper meet. Put a tiny dab of glue onto each of the adhesive points as marked and fold before leaving to dry. Whilst the inner is drying, cut a 19.5cm x 10cm rectangle from your outer sheet of paper, and round off the corners of one short side to match the shape of the inner. Cut a 2.5cm x 15cm rectangle from the inner paper or another contrasting paper and leave to one side – this will form the band closure for any embellishment. Once the inner is completely dry, mountain fold (so that the patterned sides meet) along each of the previously scored dashed lines. Place the card wallet outer wrong side up in front of you, and using a solid glue stick or double-sided tape cover with adhesive and line this up with your card wallet outer paper so that the edges with the rounded corners align. Stick the inner and outer papers together so that the wrong sides meet and re-fold along the previously scored and folded lines made on the inner paper to close. 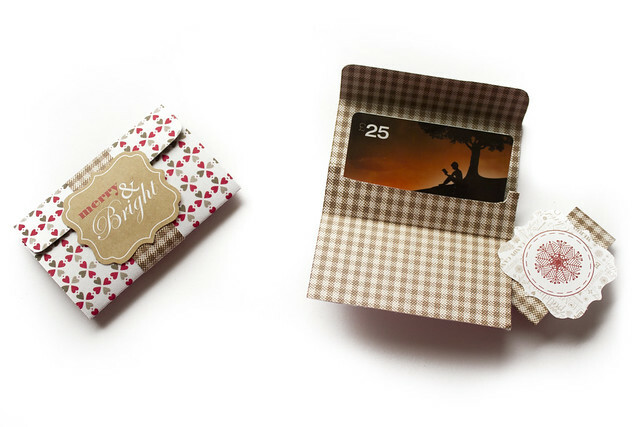 Wrap the closure band around the card holder vertically and secure with a small piece of tape. If desired the closure band can be embellished with greetings or other decorations.